I know it's a little early but I didn't want to forget. I also wanted to show off to what a smart dog I am by using a photo of our Northcott's One Nation Eagle Panel to celebrate Fourth of July. I thought it was a good idea. I'm not sure where June disappeared to. When Mom told me I had to remember to write the July Newsletter, I looked at her and said, "Already?!" She just nodded. I love Summertime, don't you? Yes, we're a little slower but I love playing in my swimming pool! I love to splash around or stand around, sometimes I even lay down in my swimming pool. Mom cleaned out my pool and put fresh water in it so now I'm really happy. I hate it when sticks, grass or leaves get into my pool and sink to the bottom. They feel yucky on my feet. Then I have to dance around in the pool while Mom laughs at me. snort. Moda has been spending more time at the Shop. If you haven't met her, she's cute but she sure spends a lot of time jumping around. She's a good pup and is learning the ropes of being a greeter. As you can see, she has a bit of an attitude towards photographs. Now, time to get you caught up on what's happening around the Shop. The 2017 Row by Row Experience started last Wednesday. 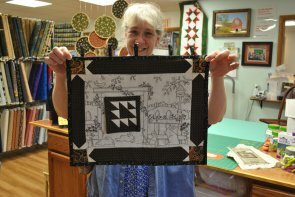 We had 2 quilting groups stop by for a visit last week. We would like to say, "Thank You for stopping by our Shop on your Shop Hop!" We hope everyone had a great time. 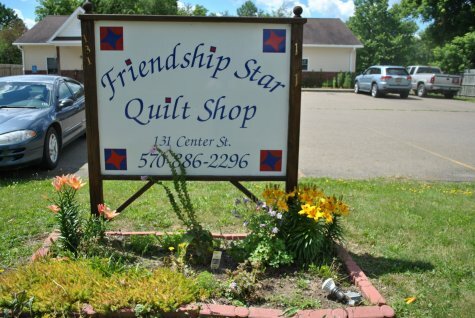 If your group would like to stop at our Shop for your own little Shop Hop, please free to call us at 570-886-2296. We will do something special for your group if we know you are coming a head of time. A week notice would be great and give us some time to do a little brain storming to make your stop special. We are having 25% Off Christmas Fabric from today through Saturday, July 1st. 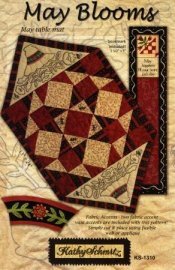 We need to move out this Christmas fabric to make room for the new Christmas Fabrics that will soon be arriving. 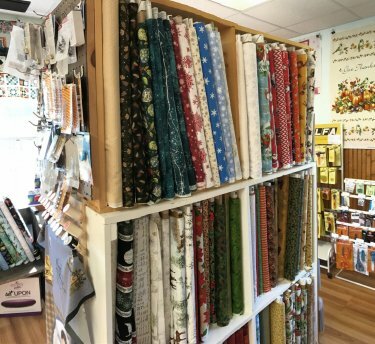 Stop in and save some money and get stocked up on Christmas fabrics for your Christmas projects. We are already half way through 2017. Summer is a bit slow for us most of the time here at the Shop. So, there isn't much news. Other than the rain has stopped, finally. My fur should be very soft by now. It's not. We do have air conditioning. So, if your too hot and need to cool off, this is a great place to come. 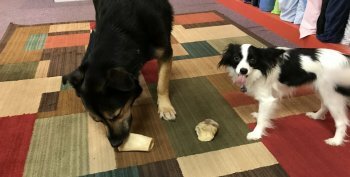 Don't forget, we have classes and Grandma will teach a class anytime she's here in the Shop. It also doesn't matter if there is 1 student or 5 students, she doesn't cancel her classes unless there is a problem or really bad weather. This brings us to our July Class Schedule. I almost forgot! 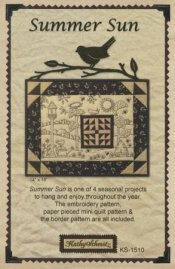 We have these primitive patterns by Kathy Schmitz just come in this past month that incorporate some embroidery with quilting. 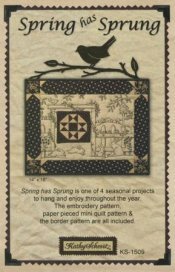 Wouldn't this look nice on unbleached muslin and you could even add homespun to it to give it a little pop. 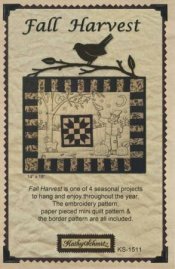 We also have a couple of small table runner patterns by Kathy Schmitz. We thought these very interesting and something a little different. If your stuck, one of these patterns may be the ticket to help you get unstuck. 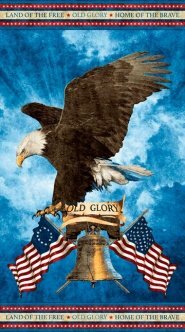 The wall hangings look like this when they are finished. They would be fun to do while hanging out watching the kids play in the pool or relaxing at the campground or on the deck/porch in the evening or early morning. 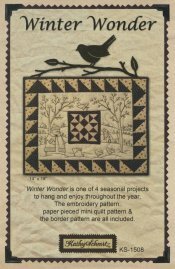 That's all for this month, quilters. I'm out of news and the swimming pool is calling my name or maybe it's the tile floor, I can't decide. We hope you are having a great Summer and hope you will stop in to enjoy the air conditioning and to give Moda and I some ear scratches and belly rubs. Any loving attention would be great. We just don't get enough around here. Mom keeps telling me to stop telling people that. She says we get plenty of attention. 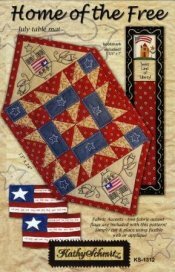 Don't forget, this Saturday is Free Pattern and Demo Day! I will be happy to help you finish your treats if you get full.